To everybody a big thank you for the nice words and I have looked at all of your blogs and replied to each of you in your blog. The results are so interesting from green tea and bean curd éclairs to the traditional chocolate on chocolate éclairs. Of course a lovely Spanish blogger also did savoury smoked salmon éclairs. I really like the very different ways that you all have handled this challenge. The various blogs I visited went from the purely educational (eat4fun) to the heartbreaking (mary) and everything in the middle. Some are beautiful beyond the ordinary (tartelete or flagrantedelicia) or peopled by newbies like me (Delicioso Mama) everybody is so varied and interesting. This was my first Daring Baker's Challenge and I was swept up in the excitement of the group. What would the first recipe be I waited for the email from Ivonne and Lisa to arrive with the entry details to the forum.... It came at last.... I hurried to the website and to my joy it was éclairs. Something I always wanted to do but never have done. Chocolate Éclairs (Yum Yum in my Tum Tum I thought) what a delight to have this as my first challenge. It was organised by the lovely Tony and Meeta. Using a recipe from Chocolate Desserts by Pierre Hermé. And what a strange recipe half water and half milk this was new and how would it taste I thought. And we had a choice we could have one chocolate element either the glaze or the filling. (Or both was fine also). What to pick there are so many great combinations mint, blood orange, coffee, and after thinking about it for a while I thought why not Sour Morello Cherry filling with a dark chocolate glaze for the éclairs. As you can see the results were excellent! The éclairs were crisp hollow and held the filling and glaze without going soggy. I was delighted and so were my friends. Congratulations on your first challenge! And what a Grand debut you made!!!! Cherry and Chocolate great combo!!!! Congrats on your first challenge! Sounds fabulous! I love sour cherries! Awesome first challenge! I love the color of the filling. Cherry and chocolate... YUM! Great job - the filling looks amazing! Congratulations on your first challenge! Thank you for the very nice comment you left on my blog. Hearing from such nice people really lifts my spirits! I love the filling choice - very original! Congratulations on the first completed challenge and welcome to DB! they look beautiful! I love that pink. love the flavour combo you picked.itr must have been so so good! Welcome to DBs. 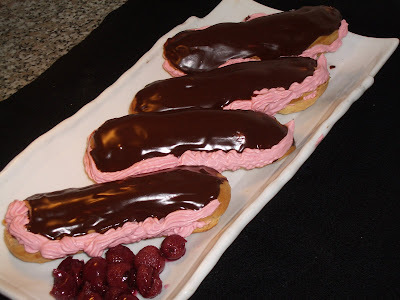 Congrats on your perfect pink eclairs and your new blog, too. Pink and chocolate looks beautiful. What an awesome filling. Great first challenge! Welcome to the BDs! Very creative filling. Great job! Congratulations on completing your first challenge! Your eclairs look great! Plus you tried a different filling! Cherry is very yummy! 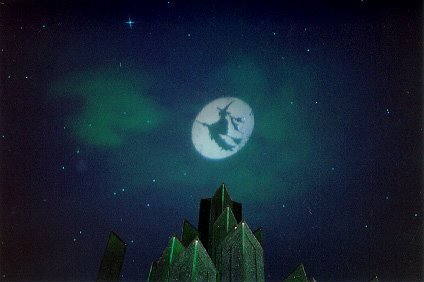 Gorgeous shots you have! 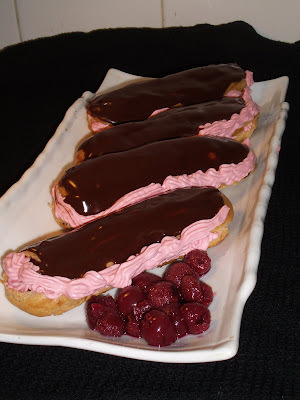 The eclairs are prettily done up and love the combo - sour cherries and chocolate! Congrats and welcome to the DBers! 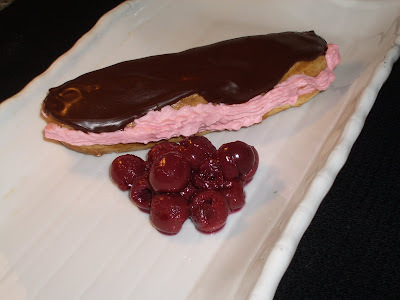 Your eclairs look amazing -- and sour cherry, that's inspired! Oh my goodness, so tasty!!! You did a great job on your first challenge. 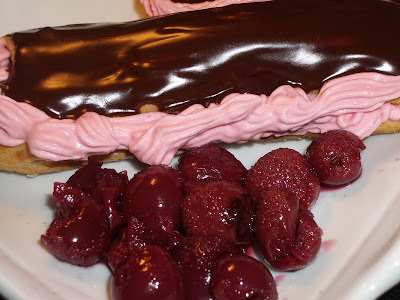 Sour cherries and chocolate are a great combination. Welcome to DB! Your cream filling looks delicious! 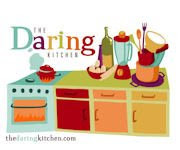 Welcome to the Daring Bakers! What fabulous looking eclairs! They're so pretty with the cherry filling. Oh, what I'd give for a taste! So pretty! Pink is my favorite pastry flavor :) Welcome to the group. Great job! You would think that you were an expert blogger. Keep it up! I love the colors. I love cherries and chocolates in combination. Very nice take on the DB challenge. Mmm, those look so cute with the pink filling. Love 'em!! I've discovered this blog through a comment you left on mine! Congratulations on your first challenge!!! Oooh...sort of like a black forest cake, yummy. And this is your first project, congratulations! Your eclairs look wonderful! I like the sour cherry filling you made. Nice alternative! The various blogs I visited went from the purely educational (eat4fun) to the heartbreaking (mary) and everything in the middle. Some are beautiful beyond the ordinary (tartellete or flagrantedelicia) or peopled by newbies like me (Delicioso Mama) everybody is so varied and interesting. 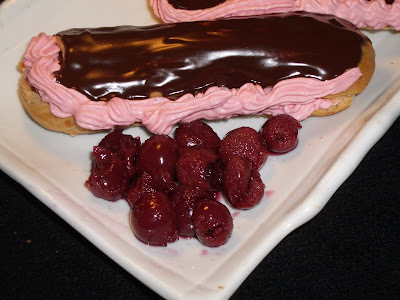 Hi Thanks for the question -- I made by eclairs mini -- bite size, that was how I was able to amke about 60 of them :-) I had to feed a lot of people at the party and it was the only way to ensure everyone had at least one! I just love your flavor choices! Beautiful, stunning, delicious! Welcome to the Daring Bakers! Thank you for the compliments! You helped me pick out my flavors and answered some questions for me in the beginning... Thank you! I think your pictures are also wonderful. Sour cherries make my mouth water, oh I wish we could all taste them! Congratulations on a job well done! Youd did a fantastic job on the challenge! Love the pink and the cherries! Uh, okay, you ARE brillant!! Haven't "known" someone so smart...I think you could have a very interesting blog on your ideas...I am a VERY simple person, but I found it interesting...there are LOTS of pics on the internet that would go with your thoughts...I am thinking of Da Vinci's "man" illustration...see I don't know what it's really called, I just find it interesting! Wow! Those look amazing! I love the flavor combination and I bet I would have LOVED your eclairs. Are you by any chance....off to Switzerland for the semi-conductor thingy ???? Be sure to pack some dessert!! Wow! Love your combination. Pink is my favorite color and it looks so stunning with the chocolate. Nice flavor combination. Welcome to the DB's.